Meet The Swag Staff is back with Episode 15. We are pleased to introduce our wonderful Pastry Chef Linda Duckett. 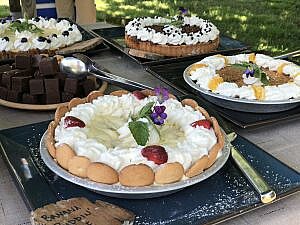 Linda is in her 13th season at our award-winning mountaintop hideaway preparing delicious sweets (including Swag Bars), homemade breads, and other baked goods for our guests! Most mornings, you can also find her at the omelette station, before she turns her attention to sweeter things. Chef Linda moved from Bristol, Virginia to Haywood County when she was 18 years old and we are so glad she decided to stick around! Before joining The Swag, Linda worked in a hospital and a nursing home, and baked purely for friends and family. She learned how to bake from working alongside her mother, Betty Sue, and grandmother. 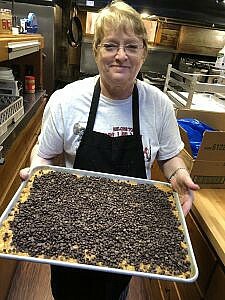 Her favorite thing to bake for her family is a Chocolate Peanut Butter Pie, but it was her Banana Pudding Pie that was featured on The Food Network a few years ago. I love baking. My favorite thing about working at The Swag is getting to do what I love. I also love the guests! What is your favorite place at The Swag? My favorite room is the dining room, looking out the big glass windows at the view. It looks like an ocean in the morning when it is foggy in the mountains! We love to play video games. Our favorite right now is The Last of Us. We also love to hike in the woods around our house. I would go to Ireland. I think I have a little Irish in me! She has been married to William (a Haywood County native) for almost 18 years and has a stepson and grandson (Bobby) in Tuscon, Arizona. They have an American Pitbull named Scarlet, and they live right off Hemphill Road. So when you are driving up to The Swag and see the red-school-house-like building, you can wave to Linda, William, and Scarlet! As everyone who has had the pleasure to visit with Linda knows, she is an incredibly kind and gracious woman. While that is 100% true, one of my favorite facts about Linda is that she loves to play action/adventure/war video games with her husband. I would not have pegged Linda for a “gamer,” but love it that she is. Linda is full of surprises! Chef Linda does an absolutely outstanding job as pastry chef and we are blessed to have her here. When people think of The Swag, they–of course–think of Deener & Dan Matthews, but they also think of Linda Duckett. Linda is a big part of what makes The Swag, The Swag. We are grateful that she is here for her 13th season, and we hope she wants to keep driving up the Swag Drive for at least 13 more. 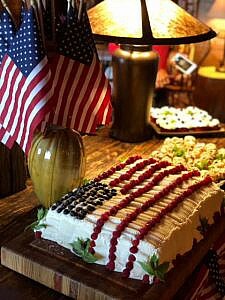 Come visit us and let Chef Linda prepare you pies, Swag Bars, cakes, breads, and pastries that you will not forget. 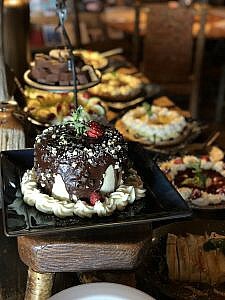 We can promise you that you will not run out of treats while you’re here! We do accept outside guests for Sunday Brunch, lunches, and dinners. Book a room online here, or call Guest Services to make a dining reservation at 828-926-0430.